Can You Make Trickshots a Career? Yep. When I was eight years old, my parents started taking me to Harlem Globetrotters games at Madison Square Garden. My love for basketball had already been established thanks to the Knicks’ magical run in 1999 with Latrell Sprewell, Allan Houston, and Larry Johnson leading the charge, but it was the Globetrotters that really captivated my imagination. They opened my eyes to a completely different side of the sport, spinning the ball on their fingers, elbows, and heads, and nailing half-court hook shots; I still remember falling into a trance as I watched their signature pre-game magic passing circle, where each Globetrotter stepped forward and performed the craziest tricks. But when the Globetrotters birthed the “trickshot,” they were really the only people who had a platform to display their skills to the world, and so the only people who made a living doing it. At 19-years-old, Kevin is one of the millennial generation who still remembers using VHS tapes, compact discs, and AOL instant messaging. But when YouTube came around in 2005 as a platform on which you could upload videos (shoutout to “Chocolate Rain”), and then in 2013 when, Instagram and Vine introduced video sharing capabilities, Kevin got Harlem Globetrotter-style exposure from his own home. “About three years ago, I posted a video just kinda out of nowhere… and it went pretty viral,” Kevin says. Two-hundred-and-seventy-five-thousand views viral. Not bad for a college kid from Medina, Ohio, messing around on a trampoline in his backyard. It didn’t take long for brands to notice the views Kevin was reeling in. GoPro and Zipcar contacted him to star in trickshot videos, the former sending over a bunch of equipment so he could get some sweet POV action footage. Even ESPN caught wind of Kevin’s insane trickshot abilities. “It was cool getting on [SportsCenter] Top 10 Plays ‘cause, you know, I always wanted to. I’ve been watching SportsCenter since I was a kid,” he said. 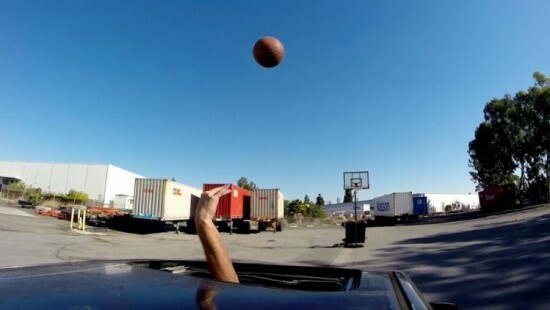 Now, there are dozens of popular YouTube “trickshotters.” Collectives like Dude Perfect, as well as ultimate frisbee fiend Brodie Smith, have thousands of subscribers on YouTube and millions of followers on social media, which equals some serious endorsement deals. For example, Brodie has partnered with Cracker Barrel, Go-Gurt, and Turkish Airlines for different promotional opportunities. He even did a collab trickshot video with the Harlem Globetrotters! Dude Perfect, a group consisting of five Texas A&M alums, was recently given their own TV show on the CMT Network. The Dude Perfect Show, which premiered last month, features more than just the content the squad produces online. We get a behind-the-scenes look into the daily lives of Dude Perfect, the celebrities and athletes they work with, and the brainstorming that goes into each trickshot. Since television is no longer the only major platform on which to consume video content, CMT realized that creating a show that featured Dude Perfect—who owns the #1 sports channel on YouTube—could effectively integrate the mega popular viral video with exclusive content to make must-watch TV. But why are people so fascinated with trickshots? How can five guys tossing a ball into a hoop draw more than a billion video views and lead to a cable television show? The trickshot video is a spectacle. You see something, and you don’t really believe (or even know) what you’re seeing, until you see a replay. It’s this aesthetically stimulating procession of confusion, shock, and amazement that grips people. What makes Kevin’s videos unique in particular is his use of a trampoline and all kinds of flips. 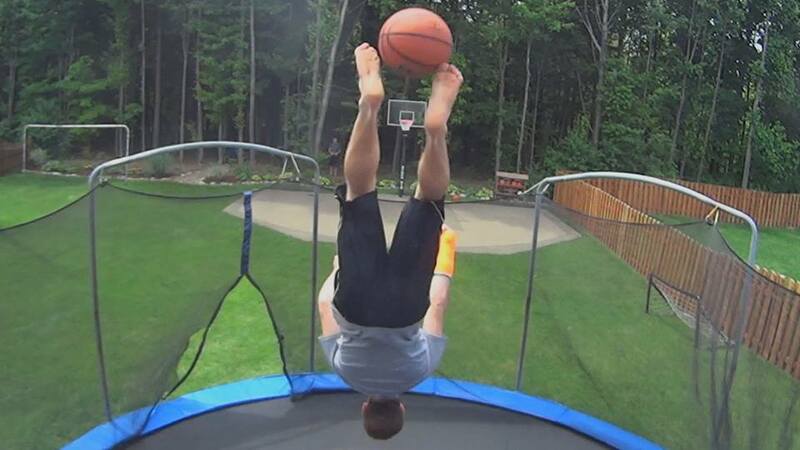 In his first viral video, “World’s Best Trampoline Trickshot,” Kevin does a back-flip then front-flip on his trampoline, and in the midst of the front-flip, he tosses the ball 63 feet into a 10-foot hoop. Admittedly, my research turned into about 45 minutes of watching Kevin’s videos because I couldn’t get enough (check out the two flips, two balls video—it’s ridiculous). Even Kevin can’t deny his obsession with trickshots. Like a BMX biker or traceur who are always looking for boundaries to clear, Kevin is constantly thinking of new places where he can complete a trickshot. He wants to branch out from his backyard and take his talents to college. A major aspect of being a successful trickshotter is having support—both interpersonal and financial. Kevin can’t just do a trickshot in his school’s recreation center. He needs some type of permit granted by the school to do so. The same goes if he were to try to attempt a shot at a local swimming pool, for example. That’s where financial backing becomes crucial. Brands and companies will take care of the expenses and permit issues for trickshotters to perform in cool locations with awesome equipment if they believe the talents are worth investing in. As we know, both Dude Perfect and Brodie Smith utilize their trickshot skills and abilties to entertain as a way to earn money. However, up until recently, a few Dude Perfect members remained involved in other business ventures since the one-off endorsement deals didn’t present a stable enough way to support themselves. Of course, when the commercials, Super Bowl promotions, endorsement deals, and a television show started popping up left and right, things changed. At this point, they could perform trickshots full-time. Brodie Smith, the second-most popular trickshotting entity, is also able to travel the world and make money doing what he loves. But, in addition to producing trickshot videos, he plays ultimate frisbee, meaning that he has two different sources of income. In all likelihood, he can’t just do trickshots. Kevin hopes to follow in the footsteps of Dude Perfect and Brodie Smith and turn his trickshot passion into a consistent revenue stream. The final question I asked Kevin was for inspiring trickshotters. What would his advice be for someone trying to get in the game? So remember Kevin’s advice, then throw in some tech savvy, physical ability, natural charisma, and social media proficiency, and you could be the next trickshot phenomenon.